Liam Gallagher has written a tribute to John Lennon on the new Oasis album. According to Stuff - The band's frontman has apparently stunned fans and even his brother - and bandmate - Noel with the poignant tribute to his hero. JJ says um.. every knows Liam loves Lennon and named one of his children after him so this is no surprise! 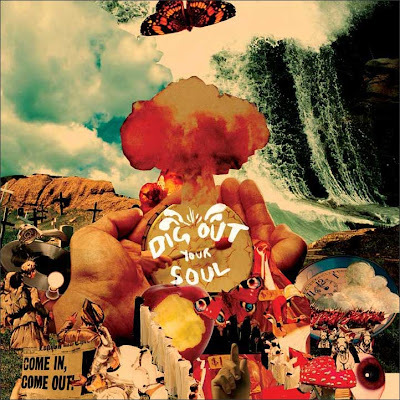 The song, called I'm Outta Time, features a clip of the late Beatles legend talking in an old interview and is already being tipped for release as a single from new Oasis album Dig out Your Soul. Noel, who is usually reluctant to praise his brother, has admitted Liam is nurturing real songwriting talent. He told Britain's NME magazine: "Liam is really good. The thing about Liam is you haven't heard the half of it. If he could even be bothered to finish some of the songs he started, honestly, they're amazing. "But he suffers the curse of the Gallaghers. It's like: 'F***ing hell, can't finish it.' I've got demos of his at home with about 40 tunes which, if he could be bothered, would be amazing." Liam - whose eight-year-old son is named Lennon in tribute to his musical hero - has always been a huge Beatles fan. The rocker previously claimed to have had an out of body experience involving Lennon, and is still reported to believe he is haunted by his ghost. 'I'm Outta Time' isn't the first ballad Liam has dedicated to one of his loves. His 2003 effort Songbird was written for his now-wife Nicole Appleton, and reached number three in the UK singles charts. Liam has also contributed two other tracks to Dig out Your Soul, which will be released on October 6. The Swamp Song is all about Oasis, Beady Eye, Noel, Liam, their songs, set lists, guitar tab & chords, concerts, fisticuffs and other witty Gems. Any corrections, set lists and stories are welcome! Holy Mountain lyrics Noel Gallagher's High Flying Birds from Who Built The Moon?